With the first pre-orders of our new 2020 i3 printer kit shipped and already arriving in the hands of our customers, I wanted to get this thread started. The build guide should be up today and I will continue to update this post with new information, troubleshooting tips, and any issues that might arise from the first kits shipped. Please post all questions, tips, tricks, and suggestions in this thread. Edited 2 time(s). Last edit at 05/22/2015 05:18PM by Dan_FolgerTech. This is great customer service Dan. Congrats on all new model and it seems like business is doing well! Can't wait to see some pics from people and get mine ordered very soon. This is great news ordered mine on the 19th can't wait to get it and start putting it together. I am new to 3D-printing, this being my first printer. So far, I am very impressed with the level of attention that Folger Tech pays to its product, going as far as to post on the forums and receive feedback to further improve the product! That was one of the big selling points when I was shopping around, I was just about to purchase the acrylic version when I saw this one pop up. I just now saw that it arrived today, unfortunately I won't be able to start building for at least a week. Until then, I will be watching this thread with great interest to see how the others are getting along. Thanks Dan, for your attention to the end-user! 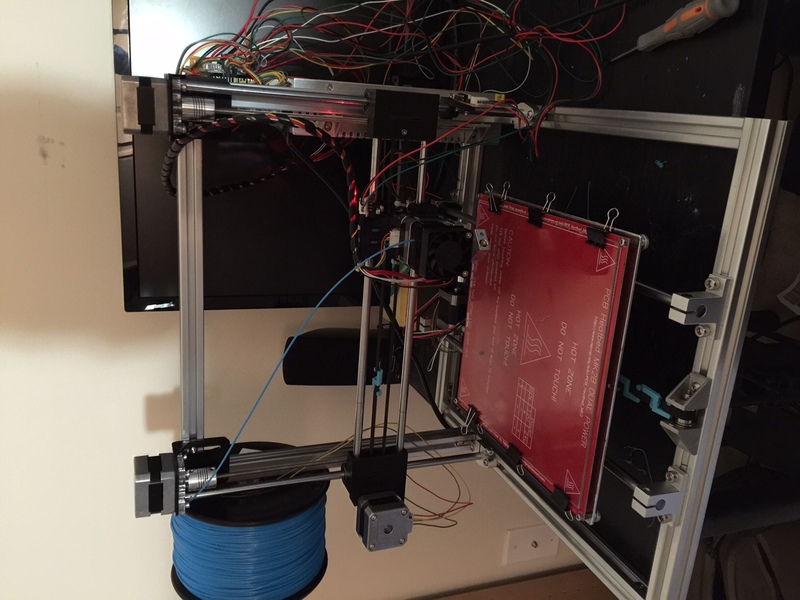 I am pretty much done putting the printer together last night. I really like the 2020 aluminum frame, makes the printer really sturdy. I was couple of screw short for the end points (M3-10MM), I had a small box with extras so I was able to finish putting those together. When running the printer, I've noticed that the X-axis step motors runs really hot. Is that normal? mottihoresh, can you post some pictures of how you mounted the end stops? I think I have them figured out, other than the bed. I can't get an idea of how to position it. From what I gather if your motors are running hot, it may be an over current issue with the driver. Concerning the screws, I was short as well. I like you have a handful of extras, I build r/c cars as another hobby. Current kit is silver, correct? I should have the build guide finished today, including the end stop mounting. Can you be more specific on the screws that were missing so I can make sure that future kits don't have them missing. Was it with the end stops? Since the guide isn't finished you wouldn't know but the end stop uses a mix of sizes depending on which end stop is being mounted. @Dan, I assumed each end stop would take 2 M3-10mm screw with nylon nut. I've kind of guessed how to put the end point. I've placed the Y axis one close to the stepper motor, z axis one next to the power supply, and the x axis one on the right side. I think that those positions are probably not the right ones because I only get around 150-160mm on the Y axis, maybe I need to move the X axis assembly back a or forward a little bit. I am really happy with the kit, I find it to be very complete. Was able to get decent print pretty quickly, I ran into an issue where the belt wasn't tight enough so i printed few belt tensioners, and then i ran into an issue where i didn't tie the Y axis gear strong enough and it was skipping a little. You should have gotten 2 belt tension springs with your kit. I am sorry if you were missing them but if you shoot us an email we can always send you some. The printed ones are nice but ours are metal and won't break as easy. Great first prints! I am finalizing the guide now. Technically you can mount the end stops wherever you want as long as you adjust things accordingly. Check the updated guide later this afternoon to see how we mounted them. Yea I think i got those, wasn't sure what there were used for. Might be a good idea to add it to the guide. I will check it later tonight. Thanks again for the awesome kit! Thank you for the pics, mottihoresh. 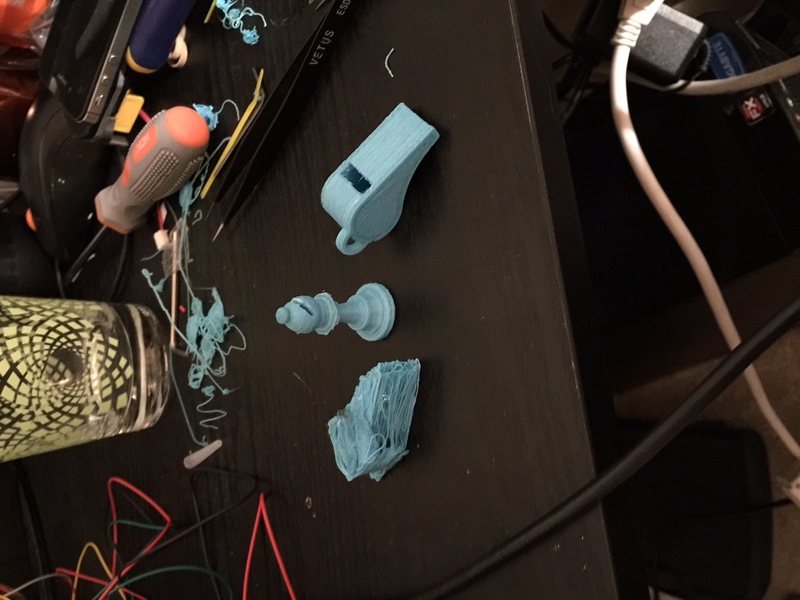 I did get mine to 'print' a cube last night, but being a complete and total noob it looks similar to your item on the left. I have a buddy at work that has a 3D printer that is willing to help me get everything adjusted. His prints look great, using a MakerGear M2. @Dan - I checked the Google Drive for an updated guide about an hour ago, but it's not there yet. HAHA. Will be checking for it after work today. As far as the kit build, it was fairly simple IMHO. We use the 80/20 extrusion stuff at work for barrier guarding on our machines. Which is part of the reason I opted for this kit & expandability in the future. Yep I couldn't figure out how those springs were supposed to attach and the manual for the acrylic printer didn't have any info on that part. The manual for this build is looking much better than the previous one. How rigid are you all finding the connection between the horizontal and vertical frames? I am still not 100% done with the guide but all that is left now is wire clean up and routing which honestly usually comes down to personal preference anyway. I am exporting it to a .PDF now, the original document is almost 700mb so it takes a bit of time. I will upload it ASAP. It's fairly rigid, there will be some flex if you move your printer around a lot. There are brackets that are available through most MRO places (McMaster-Carr, Granger, etc.). If you can get the t-nuts, you could easily fashion your own plates. I need to add the spring tensioners, but I'm waiting until I get everything else aligned first. I am not sure why but I cannot edit the original post anymore. Here is the updated Google Drive link with the latest Build Guide, Firmware, .STL files, and anything else you will need along the way. Bookmark this link as it is a live link and will be modified. Does anyone know how I can edit the top post? I had started this thread with the thought that I could update the top post as changes were made so they wouldn't get buried in the forums. Can someone have an admin reach out to me possibly? Otherwise I might have to start a new thread just so that I can at least put this most recent link as it goes directly to the drive so any changes I make to the drive will still be accessible at the same link. Edited 1 time(s). Last edit at 05/26/2015 03:05PM by Dan_FolgerTech. I'm expecting my printer will be here by Wednesday and I can begin the build! Can you recommend a thickness/type of 8x8 glass to get from Lowes/Home Depot? I've read about people having problems with some of them cracking depending on what you get. I got my borosilicate glass from McMaster-Carr. 8"x8"x1/8". I just went on the general consensus that borosilicate was the best choice. Thanks, I did see that suggestion. Since Folger Tech specified the local hardware store glass, I was hoping to avoid the $25+ piece of borosilicate. I got a 8x8 glass frame from Michaels, it was 8$ for 2 glasses. I got a box of 6 polished edge, 12" x 12" 3 mm mirror tiles at Home Depot for $13 CAD. Can't beat that price and they seem more than sturdy enough. Edited 1 time(s). Last edit at 05/26/2015 07:38PM by Vanbot. What voltage should the stepper drivers be set to? The build guide for the old model mentioned this, and I don't see a corresponding entry in the new guide. WOOHOO!! I got my 1st semi-successful print last night. There are a few layers that look 'burnt', so I'm guessing I may have been a little warm on the extruder temp. I don't recall print settings, I'm at work currently. I'll post some pictures in a bit. Those are the values that I initially set my drivers to and then I tuned them a little bit more to smooth them out. This sounds like a plan. And those sneaky people at Folger Tech printed the mailing label for the printer Monday night, but didn't ship it yesterday. Looks they shipped my filament and it will be here today though. This was from Mondays ventures, not so pretty. This is the decent 1st print from Tuesdays ventures. I know it'll get better as I get a grasp of what settings help/hinder your print quality. Monday was a holiday, no UPS or USPS. If we were really sneaky, we would have found a way to ship it. It's the other way round for me: my printer kit has shipped and should arrive tomorrow, but my filament has a label and hasn't shipped. Both labels were printed on Monday (which was a holiday, so let's give Dan and John a break!). No, I was impressed a label was created on the holiday, Dan! But then Tuesday and now Wednesday have come and gone, and the package (with the label) is still in NH. I'm just being overly anxious to get started on the build - this is very exciting to me and my son. No doubt! I'll try to be more patient. Edited 2 time(s). Last edit at 05/27/2015 05:50PM by markts. Dan/John. I'm having issues with the side mounted spool. The extruder is 'slipping' trying to pull the filament once it gets tight with the spool. I had a jam because of it. If I can source a piece of 20/20 quickly, I'm going to relocate the spool up top similar to the OG i3 users to see if removing the side load helps. Just an observation I'm noticing. A 6" long piece and a few mounts would work, if my measurements are correct. Edited 1 time(s). Last edit at 05/27/2015 10:35PM by Devil Inc.